Electronic Design serves the technical information needs of electronic engineers and engineering managers responsible for the design and development of EOEM products and systems. Do you wish to receive a FREE subscription to Electronic Design? How would you like to receive your copy of Electronic Design? *Electronic Design is now available in PDF format for easy access and archiving. The PDF is an exact replica of the print version with the added bonus of live URL links to online resources! Would you like to receive FREE eNewsletters from Electronic Design? 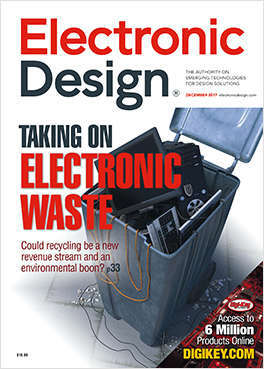 Electronic Design Today offers up to date coverage of the Electronics Industry. This newsletter is delivered 5 days a week. Electronics is becoming a mixed signal world where analog, digital and power share the same p.c. board. This newsletter delivers weekly insights into critical news covering real world parameters, signals and measurements for power and analog.